Sometimes names can be misleading, and this can be especially true when translation is involved. Other personal outside influencing factors don’t help either. Recently, I have been learning how to play the card game Magic The Gathering. It’s fantasy based, and it is a million times more complicated than poker or canasta. Magic involves specialty character cards, and many of the them work and interact differently. It makes for a game of nearly infinite and hard-to-predict strategies. Since this a basically a fantasy, Dungeons and Dragons type game, many of these cards can have weird names. The following examples are made up by myself, but they speak to the oddity that sometimes is Magic The Gathering: Codex of Dubious Confusion, Library of Lesser but Real Horrors, and Spire of Ominous Despair. All of this, recently, had an effect on how I explored Changzhou. While looking at Baidu Maps recently, I noticed something called 大悲禅寺 dàbēi chán sì. That literary translates as “big sad temple.” Since I was looking at this with my head in the Magic The Gathering fantasy world, I started to laugh. Binge listening to the Welcome to Night Vale podcast didn’t help. It’s a fictitious community radio broadcast filled with sinister dog parks filled with hooded figures and reports of supernatural happenings – yet, it has the humdrum, low-key delivery of America’s National Public Radio. In short, I projected my own personal culture onto Dabei Temple instead of thinking of a possible Chinese context. I thought if I went there, I might see a large statue dedicated to profuse weeping. So, I set out on my ebike. This Buddhist place of worship is in northwestern Xinbei. It’s near the both Changzhou’s airport and the city border with Yangzhong. In short, this is not a place easily accessible by public buses. It is also a real place of religious worship and not something aimed at tourists. Eventually, I reached my destination by traveling down a dirt road. Dabei Temple quickly revealed itself. As it turns out, Dabei Temple is neither “big” nor “sad.” It just happens to be an average countryside Buddhist temple in a very remote part of Xinbei. It has the standard courtyard set up and grounds layout of small temples. This means a main hall with a few other nooks of worship and community space. You have the usual sort of Buddha statue set up once you enter the main hall. Behind that, there is a sculpture wall dedicated to Guanyin, a figure of divine compassion. This is also a pretty common thing in the layout of temple main halls in this area — Buddha upfront, Guanyin in rear. Despite the fact that I have seen a lot of temples like this, I left this place feeling grateful. I got to see a part of Changzhou and Xinbei I have never been to before, but it reminded me something I had already known. It reminded me of a fundamental truth. I had just temporarily forgotten it due to my new obsession with Magic The Gathering and the great many professional distractions and obligations I have had over the last month. It’s this: you can’t make assumptions on things when translation is involved. Not only are you bringing your personal biases into a travel experience, but you are letting your native culture effect how you see a foriegn country. That is not a good thing. Hell, and the doorway to it, can be found in Xinbei. Somebody could accuse me of being facetious, and they would be absolutely, 100% correct! I am not talking about a mythological nether region where the souls of the damned are tormented. Actually, I’m talking about a statuary recreation of an underworld that is part of Chinese Buddhism. The torture meted out in this version of hell can be particularly brutal, but the saving grace is that the damned can pay their karmic debt and eventually be reincarnated. In Buddhism, people are not meant to rot in such a place for eternity. This display can be found at Wanfo Temple. There was a previous Real Changzhou post about this place more than a year ago, but that was more of explaining what the place was and what it culturally meant. Back then, I found it while riding my ebike in Northern Xinbei. Recently, I figured out how to get there on the public bus. Going north, I boarded the 36 at a stop in front of Xinbei Wanda Plaza. However, there are stops at points south of here. The 36 originates at the downtown train station and terminates in a part of Xinbei that’s just a couple of kilometers from the city line with Yangzhong. For a large section of the journey, this bus travels north on Tongjiang Road before turning. Eventually, I found myself in a small town called Weitang 圩塘镇. Instead of giving the street name, I would just say if you see the chimney from the industrial port along the Yangtze River, it’s time to get off the bus. Walk in a straight line towards that smoke stack. Sometimes, it will be hidden behind a building, but you can still see evidence of it on a clear day. The walkway might become a bit narrow, as you will end up walking through a working class neighborhood of desolate concrete. However, if you keep walking straight, you will not get lost. And trust me, I have been lost in this neighborhood before; it’s labyrinthine and it’s easy to make a wrong turn. So, I can’t stress how you only have to walk a straight line from the previously mentioned bus stop. A ticket runs about 10 RMB. Also, there are old ladies nearby that will want to sell you ceremonial incense. I skipped it this time, but a prior time I came here, a packet ran me about 10 additional RMB. As soon as you see something that looks like Guanyin dispensing mercy to troubled souls, you have almost found Hell.In the background of the above picture, you can see the entrance to the hall. The above picture doesn’t really do justice the gruesome detail on display here. So, consider this as an advisory. Graphic depictions of violence shall follow. The above three photos are just a minuscule sampling of what is here. A potential visitor should know that this a real religious site and not a wax museum like Madame Tussaud’s in London. The amount of carnage and brutality on display here may seem outlandish, but this is a place where I have always heard monks chanting in the background — every time I have been here. Christian cathedrals in Europe have been treated like tourist attractions, but visitors are still expected to treat the place with some sense of solemnity. The same could be said for Buddhist temples in Changzhou, China, and elsewhere in Asia. Baota Temple is a Buddhist attraction in Changzhou’s western Jintan District. It is located near a revolutionary martyr’s cemetery and Gulongshan Park. There are a number of the usual attractions to be seen — altars and dedicated spaces to kneel and pray or to light candles and burn incense. One of the more specialized spaces is an intricate hall of luohans. The hundreds of statues here are both colorful and detailed. While Buddhist temples usually have some depictions of luohans, this one is more of the epic scale that can found at Dalin in eastern Changzhou. That temple however, has Buddhist saints with more exaggerated features — literally, the arms and legs are much longer than at Jintan’s Baota. One of the more unique things here are the little statues of kids in monk’s garb. And, of course, if a visitor climbs to the top of the pagoda, they can get a good panorama of Jintan and the surrounding parks. Since this temple is in an out of the way location from the intercity bus station, it is best to pair a visit hear to Gulongshan Park, which is hilly and a good place to take a woodland walk. The day I visited, nobody at Baota charged an admission fee. According to local legend, Guanyin was key in the formation of Gehu Lake — which is also known as “West Taihu Lake.” The body of fresh water is located near the flower expo grounds in Wujin. This act of Guanyin’s was a way to show mercy to locals besieged by floods. And that is what she does. In Buddhism, she is a goddess of mercy. Some pray to her in times trouble and turmoil. This is just one of morsels of information that can be learned at Baolin Temple. This is a Buddhist religious attraction near the Wujin’s Martyr’s Memorial. Baolin is perhaps one of the biggest cultural treasures in a district that is currently seeing a lot of construction. This is true for the temple itself. In the few thousand years it has existed, Baolin has been destroyed and rebuilt a couple of times. So, it’s largely renovated now and not in its original state. One of the more recent additions in the past two years is a pagoda a friend of mine compared to a pineapple. This pagoda is dedicated to Guanyin. She is all over the exterior with golden statues and exterior paintings depicting her showing mercy to people. Baolin has a lot of the stuff you could expect to see at Buddhist temples. But the real attraction here is the four-floor-high Guanyin statue inside the pagoda itself. It is simply a wonder to behold. The pagoda has an elevator. I usually like to take it to the fourth floor, walk circles around the statue, and then take the stairs down one floor at a time. A friend said this once while visiting Wanfo Temple in northern Xinbei. We had just spent a lot of time looking at brutal and bloody depictions of torture. The temple has a room depicting diyu 地狱 aka Chinese Buddhist Hell. But that was more kitsch than off-putting. My friend was referring more to the small mausoleum we had accidentally walked into. She tends to be a lot more spiritually sensitive than me. To be honest, I had no feelings of foreboding, but once I realized where we were, I decided to stop taking pictures. I’m only posting photos here, because well, it seems appropriate. 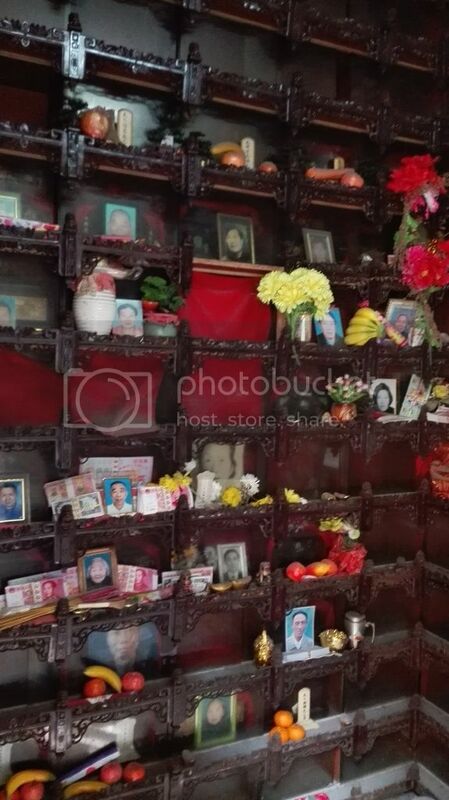 Today is Qingming 清明节 in China — Tomb Sweeping Day. It’s a festival to honor the dead and prior ancestors. Comparing this to American Halloween would be a mistake. That’s just a day people dress up like monsters and have a party. It’s much more solemn than that. In fact, it’s much more similar to All Souls Day in Europe. In some countries, like Belgium, it’s a day to go to a graveyard and clean and respect your dearly departed’s burial plot. Traditionally speaking, Qingming is sort of the same in spirit. How the dead are respected, however, might be a little more different. The mausoleum my friend and I walked into was filled with pictures of the dead. Sometimes, flowers were near these pictures, and other instances sacrificial offerings. Quite often, this takes the form of food or fruit. You see this often in temples — especially altars devoted to Buddha. Only, here, you could also find bundles of “hell money.” Its a special type of Joss Paper printed to look like cash. More often, these bills look like the red 100 RMB note. The idea is that you are giving a form of spiritual currency that they can spend and use in the afterlife. I found this all quite fascinating to look at — until I recognized one subtle detail near some of these pictures. Behind glass, wooden boxes sat. I quickly realized that these were likely urns filled with ashes. Human remains were all around my friend and I. While I had not had any sense of foreboding before, I was a little unsettled now. I was looking at this place from the perspective of a curious foreign tourist, and I realized it would be best to leave and leave the dead in peace.